DaphDaph, has designed yet another amazing product -BonBunz Hair Bands, perfect for this season's stocking stuffer! 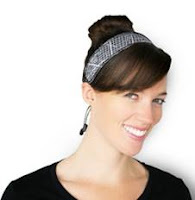 These are the most comfortable and fashionable hair bands! They come in an assortment of over 15 cool, creative designs and colors and are super easy to use and comfortable for the busy life. The end to headband headaches - these head bands boast soft cushioned Neoprene material on the outside and textured rubber on the inside that prevent those awful headband headaches and guarantee hours of an extra hold! You just place them on your hair, adjust the patented bungee cord lock to your comfort and they stay put all day without a need for readjustment! They are great for outdoor sports, swimming, running, soccer, yoga or relaxing in the sun and everyday activities. Just wrap and pull! Puts an end to those headband headaches! No slip head bands - guarantee hours of sturdy, extra hold! Uniquely patented design: easy pull cord adjustment for a perfect fit! Sporty, comfortable and fun; perfect for active lifestyles of women and girls! Water resistant and machine washable! Can be personalized with names, team or company logos! Price: One $14 and the second for $12 (an additional holiday savings 15% off and free shipping going on now). These cool and colorful headbands are this holiday season perfect gift - the greatest stocking stuffer we can think of! 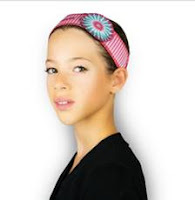 Bonbunz is a line of fun and colorful hair bands for girls, teens and women alike. The BonBunz provide easy hairdo solutions for the active life style. Bonbunz is a line of fun and colorful hair wraps. You just wrap your hair and pull the patented bungee cord lock for a customized feel. These wraps boast soft cushioned materials and fun designs that are super easy to use and comfortable for the busy life. They are great for outdoor sports, swimming, running, soccer, or relaxing in the sun and everyday activities. Just wrap and pull! Learn more about fashion accessories such as hair bands in our fashion terminology section.